After a week-long lull, Pakistani troops violated the ceasefire twice on Sunday by firing on forward posts along the Line of Control in Rajouri district in which one Indian soldier was killed. Indian troops retaliated to the firing. 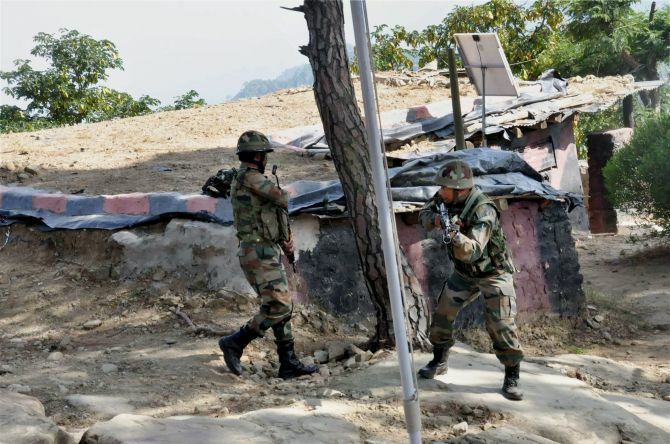 “There was unprovoked firing from small arms on forward areas in Naushera sector of Rajouri district along the LoC by Pakistani troops,” PRO, Ministry of Defence, Jammu said. Indian troops guarding the LoC retaliated, he said. In a ceasefire violation in the morning, no one was injured. However, the evening firing claimed life of one Indian soldier. A senior Army officer said there have been over 25 ceasefire violations along the LoC in Jammu and Kashmir after surgical strikes by Army troops in Pakistan-occupied Kashmir to dismantle terror launching pads. In the firing and shelling, five civilians and four armymen had sustained injuries in Poonch district. Nine Pakistani armymen were injured in retaliatory action by Indian troops along LoC. On October 8, Pakistani troops had fired on forward Indian posts along Mendhar Krishnagati sector in Pooch district resulting in injuries to one jawan. On October 5, Pakistani troops had violated the ceasefire thrice and resorted to heavy firing and mortar shelling targeting several Indian posts and civilian areas in three sectors of Poonch and Rajouri districts. Pakistani troops had on October 4 targeted 10 forward areas with mortar shelling and firing with five ceasefire violations on Indian posts and civilian areas along LoC in four areas of Jammu, Poonch and Rajouri districts. They shelled mortar bombs and opened small and automatic weapons in Jhangar, Kalsian, Makri in Noushera sector of Rajouri district and Gigriyal, Platan, Damanu, Channi and Palanwala areas of Pallanwala sector of Jammu district and Balnoi, Krishnagati in Poonch district. Pakistani troops had on October 3 violated the ceasefire four times and restored to heavy firing and mortar shelling in Saujian, Shahpur-Kerni, Mandi and KG sectors in Poonch district. On October 2, Pakistan resorted to firing and shelling from 1915 hours along LoC in forward areas in Pallanwala belt of Jammu district. 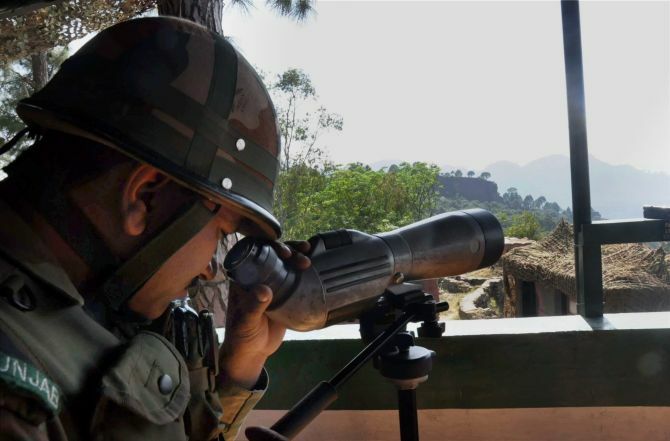 On October 1, Pakistani troops had shelled Indian posts and civilian areas with mortar bombs, RPGS and HMGS amid small arms firing along LoC in Pallanwala sector in Akhnoor tehsil of Jammu district. On September 30, Pakistani troops restored to small arms firing along the LoC in Pallanwala, Chaprial, Samnam areas of Akhnoor sector of Jammu district.